1. To make the curry paste, place a pan lined with a square of foil over a medium heat. Spoon the shrimp paste into the centre of the foil and toast for about 1 minute, or until the paste becomes fragrant. At this point remove the foil from the pan and place to one side. Put the toasted shrimp paste and all the remaining curry paste ingredients into a small food processor and blitz until smooth. Transfer to a bowl and set aside. 2. For the curry, heat the oil in a saucepan or wok over a medium heat. When hot add the curry paste, and cook for 2-5 minutes. 3. Add the chicken and stir-fry for 2 minutes, coating it in the paste. Stir in the fish sauce with the palm sugar and Shaoxing wine, and bring to a simmer. Cook for 1 minute, then add 750ml water. Return to the boil, add the star anise, lemongrass and kaffir lime leaves, and reduce to a simmer. Cook for a further 10 minutes, or until the chicken is thoroughly cooked and there is no pink meat. 4. Add the green beans, mangetout, beansprouts and pak choi, and stir through the sauce. Cook for 2-3 minutes. Stir in the herbs and adjust the seasoning, if necessary, by adding more fish sauce. 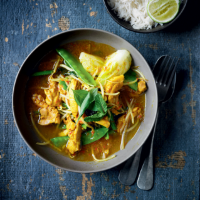 Serve the curry in large bowls with Thai sticky rice and a wedge of lime to squeeze over.